Nothing suitable in promotional tins? Promotional custom tin packaging is a great way to present your corporate gifts inside. We can do custom sized and shaped tins to suit your business and brand. Custom printed tins are a great way to make your business gift unique. We also have pencil tins, round tins and tin tubes available for any event or function. These creative promotional items can easily be personalized with your branding. Movie roll shaped tins are innovative and a great packaging tool for any film/television event. 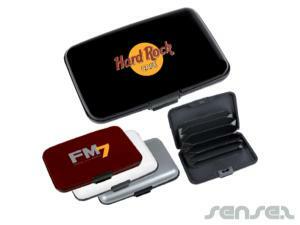 Promotional custom branded tins are an exclusive way to give your brand constant awareness. Promotional branded tins are suitable packaging for any corporate and premium give away. These stylish tins give an exclusive feel to anything stored inside. Functional promotional items such as these branded tins are efficient and create the most effective marketing tool for your business.